By now, you've told us about yourself but you haven't told us where you want to play. Next to each child's name you'll see a "Register" button. Different programs have different age restrictions. If your child is ineligible for a particular program the "Register" Button will be grey'd out and actually say "Ineligible"
1) If your player is eligible then Click on the "Register" Button next your your child's name. 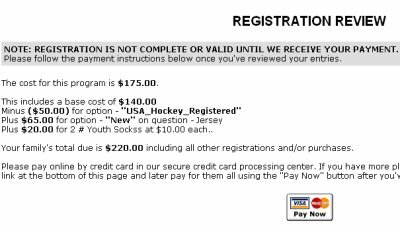 2) Way back in Step 1 - (about 5 minutes ago if you are following along) you registered at USA Hockey and you got a confirmation number. If you didn't keep that webpage up then go check your email because you need that number now. Enter all the information on the form. Be sure to read the USA Hockey Code of Conduct and click on the "I Agree" box - then hit "Submit Information". 3) When you hit submit you'll come to a confirmation page. On that page you get the option to pay for your player. If you have more than one player, then don't pay now, you can pay for everyone all at once later. A copy of that page is emailed to you for your records and also to the registrar. After hitting submit you'll get another confirmation page. It would look like this for our demo family. The system keeps track of a "Family Total" If you click on the "Pay Now" button you could pay your "Family Total" at once. If you paid - That's it - Your Team manager will contact you regarding the season. If you didn't pay at the confirmation page Click on Payment Options for more information.